Vyacheslav Maltsev. Source: Youtube.“0 days, 0 hours, 0minutes, 0 seconds until the new historical epoch begins” - this is what the timer on the website of Vyacheslav Maltsev's Artpodgotovka movement currently reads. Maltsev, leader of the radical populist movement, promised that Russia would experience a revolution on 5 November 2017. Regime change would be heralded by spontaneous protests, with cities occupied across the country. Artpodgotovka would storm the Kremlin, before holding a “popular referendum”. Raising their hands, those present would vote for the overthrow of Russian president Vladimir Putin. Russia’s new revolutionaries hoped to repeat Ukraine’s EuroMaidan scenario, but this “Russian Maidan” did not happen. On 5 November, more than 400 people were detained — 302 of them in Moscow. Many arrestees had weapons confiscated from them. (There were clearly less protesters on Russia’s streets than the security services anticipated.) At the same time, the security services conducted a series of raids across Russia, with 14 alleged activists of Artpodgotovka detained with ready-made Molotov cocktails and explosive devices in their possession. Alexey (name changed) came from the Urals town of Perm to St Petersburg to make revolution. In a secret chat on the Telegram messaging app, Alexey told me how he had planned to steal weapons from police officers during the failed coup. He travelled to Russia’s northern capital with 10 other men, all wearing balaclavas and shin-pads. A friend of Alexey’s had taken 40,000 roubles (£510) in credit to buy food for the plotters while they occupied St Isaac’s Square in the centre of Petersburg. He was counting on the full credit amnesty that Maltsev had promised after the revolution. But on 5 November, the Russian people didn’t come to power, and it seems that this would-be revolutionary will have to return the cash. Apart from a debt amnesty, Artpodgotovka’s political programme includes points such as the “immediate removal of Putin and his band from power”, ending Russia’s foreign military operations, cancelling all taxes, raising pensions and wages and “returning national goods stolen by corrupt people”. 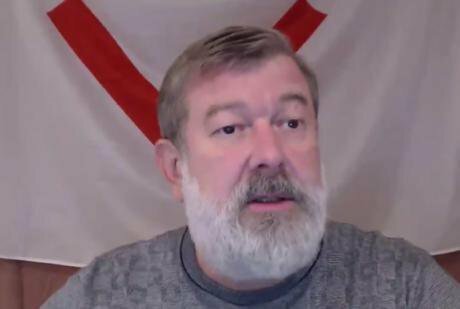 Artpodgotovka, which means “artillery training”, emerged at the end of 2013, when Vyacheslav Maltsev, a former deputy in Saratov’s regional parliament, began to regularly publish his “Bad News” programme via his YouTube channel. During Maltsev’s hour-long broadcasts, he would criticise the authorities, telling his audience what would change in Russia after the revolution. In 2013, he started calling 5 November the day of a “people’s referendum” and a starting point for a “new historical epoch”. A slogan appeared (“We’re not waiting, we’re preparing”), and the date of the revolution began to be referred to as “5.11.2017”, a symbol in its own right. This cryptic number began appearing in graffiti form on fences and walls in sleepy suburbs across the country. Maltsev’s channel, which was blocked in Russia on the day of the revolution, now has 135,000 subscribers and 87m views. A week before the auspicious date, Nikita hacked the wifi routers installed in several Moscow metro carriages, uploading agitprop for Maltsev’s movement instead of the usual adverts. Even the city newspaper failed to notice it. This kind of minor “actionism”, it seems, forms the core of Artpodgotovka supporters’ activity. Oppositionist Vyacheslav Maltsev (right) posing for photographers during the opposition march on Sakharov Avenue in Moscow. (c) Yevgeny Biyatov / RIA Novosti. All rights reserved.Screenshots of the hacked adverts were posted on Artpodgotovka Telegram chats with several thousand users. The movement attracts a range of people, from ideologically neutral university students like Nikita to 40-year-old nationalists, who tend to dominate. These Telegram chats are home to both serious revolutionary ambitions and videos of anonymous bloggers wearing Guy Fawkes masks, making teenage reflections on the necessity of hacking Russia’s television networks. In one chat, I watched how users discussed Mr Robot, an US TV show where a group of hackers destroys the global banking system. Several admins of these chats told me how they created these channels themselves. They reckon that, in Russia’s regions, Artpodgotovka is more like a circle for like-minded people, a chat with roughly 100 people. Maltsev told me that the number of chats was unexpected. The week before 5 November, people began organising into city-specific “defence units” and groups for sending out agitprop. Several people even gave out blank Google accounts for people to use to spread propaganda on YouTube. In the “defence unit” that I followed, activists compared what resources they had, giving each other identification numbers, but there was absolutely no coordination on the day itself. Even the unit’s “leader” refused to go out onto the street. A pre-revolutionary message on Telegram: "Comrades, we've got 3k people in the group. Tomorrow 7k maximum will come out. We need to stand till the end. That's when everyone else will come." This refusal could have had something to do with events at the end of October, when a Siberian regional court declared Artpodgotovka an “extremist organisation”. True, the ban hadn’t yet come into force. The movement isn’t currently on the Ministry of Justice’s list of banned organisations, but state news agencies are already referring to Artpodgotovka as “banned in Russia”. The court order’s description of Artpodgotovka as “an inter-regional civic movement” is far from reality: Artpodgotovka was only really organised in Moscow region, where it had a “People’s House” (a kind of open consultation office) for a while. Maltsev and his supporters called the absence of organisational structure a “decentralised revolution”. Aside from Artpodgotovka, Vyacheslav Maltsev has a rich political biography under his belt. In 1994 he became a deputy in Saratov’s regional parliament, where he remained for three terms. According to Maltsev, it was there that he became friendly with Vyacheslav Volodin, the current speaker of Russia’s State Duma. Until 1996, Maltsev also ran a private security firm in the city. In 2001, Maltsev was involved in setting up Saratov’s branch of United Russia. Today, Maltsev explains his work for the Russian authorities by referring to the fact that, according to the original idea, United Russia was supposed to oppose Russia’s new president, Vladimir Putin. But this didn’t happen, and in 2003 Maltsev left United Russia. Three years later, Maltsev, completely disillusioned with the new party of power, sent the leaders of Russia’s political parties his “Manifesto of Struggle” against United Russia. Around the same time, in 2003, Maltsev began working on a campaign against Saratov’s regional governor, Dmitry Ayatskov. Supporters of this campaign even held pickets in Moscow. In 2005, after regional elections were annulled, Putin chose not to appoint Ayatskov as Saratov governor — the leader of Artpodgotovka considers this his own achievement. Maltsev only came to be considered a real political figure in 2016, when he took first place (with the help of his YouTube channel) in the primary elections for the People’s Freedom Party, better known by its acronym PARNAS. He was added to the federal party list, but neither he, nor his fellow PARNAS members made it into parliament in Russia’s September 2016 election. Nevertheless, he still managed to make a public call on national television to impeach Putin. Vyacheslav Ryabkov, an Artpodgotovka member from Chuvashia, faces criminal prosecution for repeatedly breaking regulations on public meetings. Source: Facebook. Indeed, it was in 2016 that Maltsev managed to cause some dissatisfaction in the party for his xenophobic rhetoric. Artpodgotovka’s political programme still includes a paragraph on a visa regime for Central Asia states. That said, Maltsev has stated he is ready to make peace with Russian Muslims for a successful revolution. 13 April 2017 saw Russian law enforcement search the apartments of Maltsev and Ivan Beletsky, leader of Russia’s Party of Nationalists, in connection with an attack on a police officer during anti-corruption protests in Moscow on 26 March. 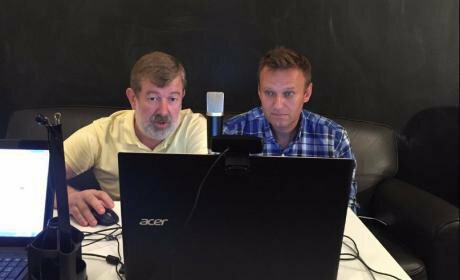 Maltsev managed to start live-streaming his detention, before he suffered a cardiac arrest. Law enforcement also searched the home of Alexey Politikov, a supporter of Maltsev, in connection with the same case. After another house search on 10 June, Politikov was arrested the next day. In October, Politikov was sentenced to two years in prison after confessing to attacking a police officer and agreeing that his case would be examined under special procedures. Following these searches and detentions, Maltsev fled Russia for France, where he established himself together with several supporters. 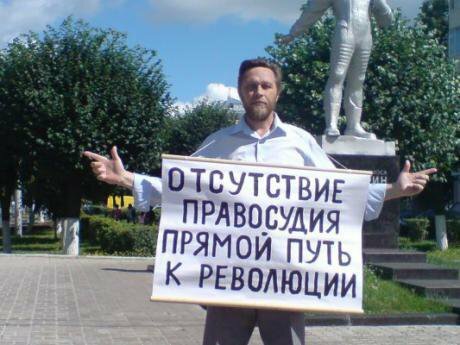 While Maltsev continues his YouTube broadcasts, the Artpodgotovka supporters who remained in Russia face repression. In the summer, several supporters in the regions were fined for “systematically breaking regulations on public demonstrations”, and others were arrested for political agitation. 13 April: Vyacheslav Maltsev suffers from a heart attack before boarding a plane for Moscow while under arrest. According to Maltsev, Russia’s new revolution was meant to start on 4 November, at the “Russian March”, a nationalist gathering held in Moscow annually. The revolution was meant to continue overnight, but instead, Russia’s nationalist movement, full of internal incriminations and forced exile, experienced another split. Four of the five organisers (the Party of Nationalists, who support Maltsev, remained) refused to participate in the march, calling it a “farce” on stage. After the event was cancelled, the police forcefully detained protesters as they left. Beletsky, leader of the Party of Nationalists, told me that he believes the reason for the rally’s cancellation was interference from the FSB. Beletsky, who is currently a witness in three criminal investigations in Russia, is now outside the country. His VKontakte page is blocked, though you can correspond with him via other messengers. It appears that, to follow Artpodgotovka’s slogan, it was the Russian security services who were “not waiting, but preparing”. On 31 October, Russia’s new National Guard started a two-day training mobilisation, and a few days later the round-ups against the movement started. For several days in early November, the FSB reported on its successful operations against “Artpodgotovka conspiratorial cells” and confiscated Molotov cocktails, explosives and weapons. 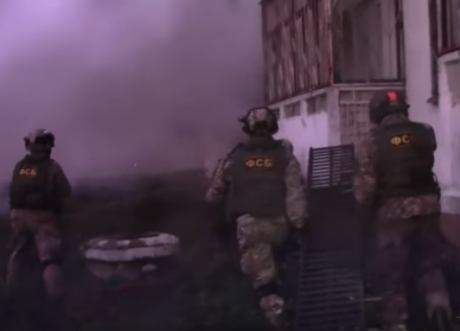 On a video published by the FSB, you can watch how security officers blow open the window of an apartment, where they find firearms and explosive devices. At the same time, Telegram moderators began blocking chats and channels used by the movement, though not en masse. It seems these channels were used for “calls for violence” by members of the movement, which goes against the app's code of conduct. FSB storms apartment of Artpodgotovka members. Source: Tass. All rights reserved.On 5 November, police detained not only people protesting, but even random passers-by. For example, people attending the Adam Smith Lectures discussion forum in Moscow were detained as they walked to McDonalds after the lectures, 1.5km from where the Artpodgotovka protests were due to take place. 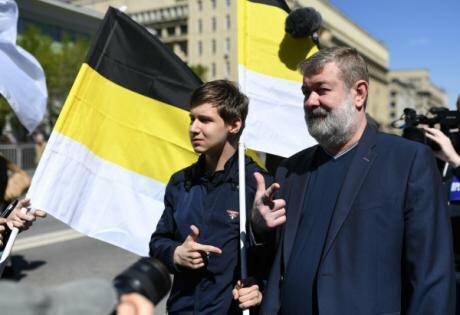 After the “revolution”, the authorities opened an investigation into signs that Maltsev and his followers had organised a terrorist group. Apparently, members of Artpodgotovka had planned to commit arson attacks against police officers and public administration buildings. Indeed, the police operations continued — on 10 November, for example, the Investigative Committee reported how Artpodgotovka members had planned an operation in a Moscow park. They discovered these plans, as ever, thanks to the movement’s Telegram channels. The idea that the protesters detained in central Moscow possessed weapons has provoked doubt from some observers, but instructions for how to make Molotov cocktails, as well as images of weapons sent by members of Artpodgotovka’s “defence units”, are documented in the movement’s chat archives. Some supporters even collected money to buy tires to make barricades with. None of this equipment was to be seen on the streets on the day of the “revolution”. Back in October, a message from an anonymous account was distributed on Artpodgotovka’s chat network. Apparently, the author was a member of the group behind Russia’s recent wave of “telephone terrorism”. For three months now, scores of public buildings across the country have been evacuated after bomb threats via telephone. On 5 November, the Bolshoy Theatre, GUM department store on Red Square and 17 other buildings were evacuated in Moscow. I spoke to one person allegedly involved in this telephone campaign (to prove their authenticity, they predicted two evacuations, though did not support these claims with any further evidence, such as VPN phone-call logs or screenshots from chatrooms). They also promised that public administration buildings would suffer arson attacks on 5 November (the conversation took place in October, prior to the mass arrests against Artpodgotovka), but this did not happen. Justifying the mass evacuation of Raiffeisen Bank branches and call centre in October, this account mentioned the “yids profiting off people” with the help of the financial institutions and stated that these telephone calls were meant to damage the infrastructure of the security services. At the end of the conversation, he sent a .doc file, signed by “the People’s Destabilisers”. It contained a report on an apparent 3,007 bomb threats made between 25 September and 9 October this year. After this, the account stopped answering my messages. This video from an account called “The People’s Destabilisers” lists Russia’s problems and calls for war against the Russian authorities. The video was uploaded in April this year. The bomb threats have continued. 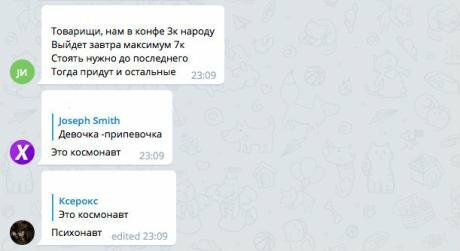 So far, only a police source in conversation with Mash, a Telegram news channel run by former Life News employees, has mooted the theory that “5.11.2017” and the telephone calls are connected. There’s no open confirmation of it available. Vyacheslav Maltsev told me that people had asked him about the connection during his live YouTube broadcasts: “We just laughed and said that this would distract the police on 5 November.” Still, users of Artpodgotovka’s chats remember that Maltsev made calls for the same kind of partisan war as the “people’s destabilisers” during his live shows. Despite numerous detentions and criminal cases against Artpodgotovka supporters, Vyacheslav Maltsev does not consider 5 November a failure. He says it’s only the beginning. He calls the people detained “defenders of constitutional principles” and has accuses the Russian police of unlawful actions. Failures aside, Maltsev is responsible for a minor media revolution — live online talk shows on politics have become a fully-fledged genre, occupying their own niche on Russian YouTube. Maltsev’s victory at the PARNAS primaries already demonstrated that his audience has a certain electoral potential. Vyacheslav Maltsev and Alexey Navalny, April 2017. Source: Vkontakte. All rights reserved.Every Artpodgotovka video includes details of how viewers can make donations to the movement. By 16 November, in Bitcoin alone, Maltsev had received more than 10m roubles (£127,000). This isn't the movement's first Bitcoin wallet, either. and some of the individual donations reach up to five Bitcoin (given that one btc is currently worth roughly $8,000, that is a not insignificant amount of money). It’s worth noting that Artpodgotovka’s Bitcoin are constantly moved to other accounts through “mixers”, services that combine existing funds with others at random to produce harder-to-trace funds. By 14 November, the movement’s main bank account had roughly 5,000 roubles (£63) left on it. There’s also a special site where subscribers to Artpodgotovka can make donations on the proviso that they will receive their money back after the revolution. Maltsev uses the phrase “the people” constantly, including on air. Speaking to him one-on-one, he reminds me of a taxi driver confidently stating his beliefs. Maltsev’s profile as a blogger emerged during the rise of rightwing populism in Europe and the US, and he has become its Russian reflection. His supporters are reminiscent of Donald Trump’s: working class men from the periphery, who are ready to fight the establishment, and who like to discuss their methods of political struggle, meanwhile, in anonymous chat rooms. Maltsev’s audience, like him, are fans of conspiracy theories — one prominent conspiracy prior to 5 November concerned a plot by sniper units connected to Chechen leader Ramzan Kadyrov to fire on National Guard troops during the “revolution”, thus discrediting Artpodgotovka. After the revolution failed to happen, the number of “dislikes” on Maltsev’s videos began to rise. Many were disillusioned in the leader of Artpodgotovka. In the comments, former supporters called him a traitor (some also made anti-semitic slurs), criticising him for not supporting detainees. The press have reminded Maltsev about his friendship with Vyacheslav Volodin more frequently, and accused him of provocation. After all, “preventing revolution” and “fighting terrorism” look good for both the Russian security services and on Russian television screens. Judging by Artpodgotovka’s chat rooms, Maltsev’s supporters are planning to join the campaign of Alexey Navalny, who unexpectedly endorsed activists from Artpodgotovka after the “revolution”. Navalny believes that the number of people arrested in Maltsev’s failed revolution will exceed that of the Bolotnaya case, when the Russian authorities imprisoned over 30 people in connection with protests held on the day of Vladimir Putin’s inauguration as president in 2012. It’s a different matter, however, if anyone else will offer support to the men and women about to figure in Russia’s next big political trial. Maltsev’s supporters are rather different from the people who protested on Moscow’s Bolotnaya Square five years ago. The majority of those in detention centres today are fans of utopian schemes for taking over television networks and the headquarters of the security services. This time, it seems, there wasn’t even enough of them for a peaceful protest.